I’m a huge fan of the 60’s Michael Caine film ‘Get Carter’, particualrly the cinematography and the bleak northern landscapes it portrayed. In particular, I have long been intrigued by the final scenes of the aerial ropeways taking coal to the staithes. 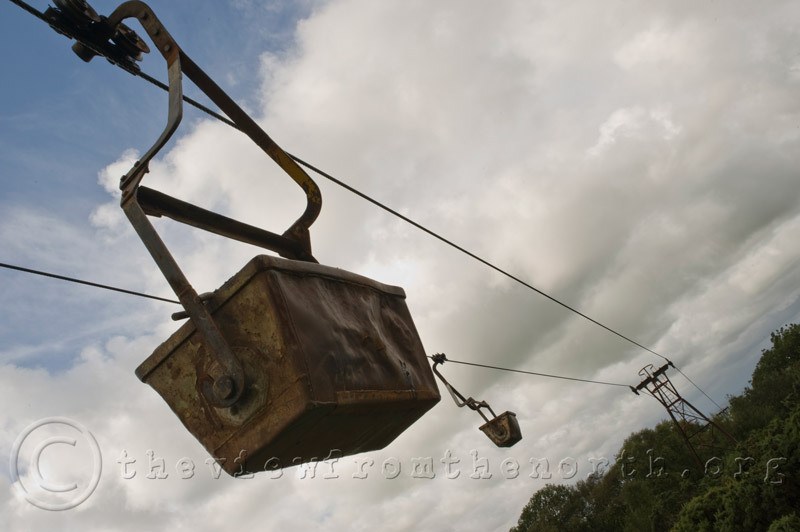 This landscape has all but vanished, but I discovered that there was one ropeway left in the country, and it was just up the roadat Claughton Manor Brickworks in Lancaster. It was a Friday afternoon when I went, and it had stopped for the day, and the hoppers were dangling in the wind blowing off Caton Moor. They make for a strange scene, possibly due to their unfamiliarity these days, but it was interesting to see this ancient method of moving raw materials about, still in operation in the 21st Century!